to get into the water at Point Panic. Leihinahina Sullivan was body-surfing at Point Panic yesterday morning when she and other swimmers and surfers noticed a rainbow sheen on the water. "At first we thought it was passing us, then all of a sudden it surrounded us," she described. "That's when I told everyone to get out and wash off with soap." The sheen was the result of a diesel fuel spill that could have occurred yesterday or Tuesday. It was reported to the Coast Guard at 10:15 a.m. yesterday, too late for investigators to determine the source of the discharge. 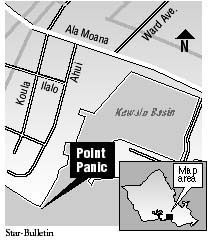 Sullivan said fuel spills from the boat harbor behind the Fisherman's Wharf Restaurant have been spreading to Point Panic and Kewalo Basin once or twice a month for the past six months. "I don't expect diesel to be spilling out of a harbor area where it goes directly into a recreational zone," she said. Representatives of the Coast Guard and the Department of Health said fuel spills in the area are frequent but generally not big enough to close the beach to swimmers. "A gallon of diesel can cause a sheen from Sand Island to Aloha Tower," said Lt. Mark Willis of the Coast Guard Waterfront Facility Enforcement. He said the preliminary report from investigators yesterday indicated that the sheen was caused by less than 10 gallons of fuel and "noncleanable," which means the fuel could not be contained or collected with absorbent materials. The fuel would dissipate or evaporate in sunlight, Willis said. William Perry of the state Department of Health said that by yesterday afternoon the sheen had disappeared except for a pocket in the cove behind John Dominis Restaurant. Although the Health Department does not close the beach when there are sheens on the water, swimming at that time is not advised. Perry said the diesel fuel sheen could cause eye irritation, respiratory problems and skin rashes. "A good shower will more than likely take care of it with most of the population," he said, but, depending on the length of exposure to the fuel, medical attention may be necessary. The residual pockets of sheen and the smell did not deter surfers at Kewalo Basin or Point Panic yesterday afternoon, however. 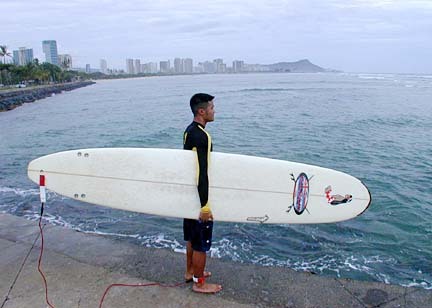 Joe Maikai, who body-surfs there about three times a week, went in anyway. "I did my exercise," he said. "I just wanted to swim." But Maikai said he cut his swim short, only catching a couple of waves because of the diesel smell. Even after he had washed off, "I kind of smell it on my body," he said. Others did not even notice, such as Malcolm Ing, who surfed Kewalo Basin yesterday. "It's almost always clean here," he said, adding, "The water didn't taste funny." Mike Rogers said he was not concerned there might still be fuel in the water. "Diesel doesn't bother me," he said as he descended the stairs at Point Panic. "It hasn't proven to cause cancer on me yet," he said. Michael Yano summed it up: "It's part of the hazards of swimming at the point."